I formulated 911 Butter in 2013 to help manage pain from inflammation in my hands. The base ingredients include organic cold-pressed unrefined hemp seed oil* and natural beeswax. Six powerful essential oils stimulate circulation; white camphor, peppermint, eucalyptus-lemon, clove bud, cinnamon leaf, and lavender. A small amount of grapefruit seed extract is added to assure a good shelf life. Most folks agree that it absorbs quickly, has an uplifting aroma, and provides subtle relief within 10 minutes after application. 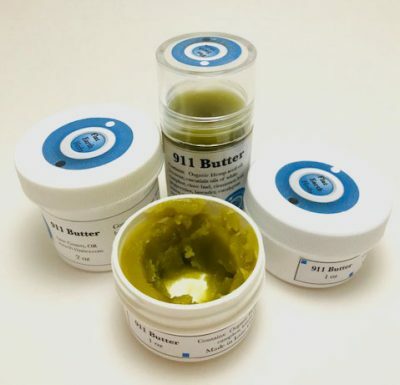 911 Butter is available in a 2 oz jar, 1 oz push-up tube and a 1 oz jar. Learn what 911 Butter users have said about how it helps them on the Testimonials page. Due to the nature of essential oils, avoid applying 911 Butter on any open wound, cut, or other sensitive areas such as lips, eyes, nose, etc. *Hemp seed oil does not contain detectable Delta-9-Tetrahydrocannabinol (THC) or Cannabidiol (CBD).